The 24-year-old provoked controversy when he refused to be taken off during Sunday’s Carabao Cup final. The Blues were defeated on penalties against Man City. CHELSEA MANAGER MAURIZIO Sarri has dropped his number one goalkeeper Kepa Arrizabalaga to the bench for tonight’s Premier League meeting with Tottenham. The 24-year-old caused considerable controversy on Sunday when he refused to be substituted for Willy Caballero ahead of the Carabao Cup penalty shoot-out against Manchester City. The Spaniard had been struggling with cramp throughout extra-time, with his decision to defy Sarri’s instruction causing the Italian visible frustration on the touchline. Caballero has been named to start for tonight’s game against Spurs, with Kepa reduced to a place amongst the substitutes at Stamford Bridge. 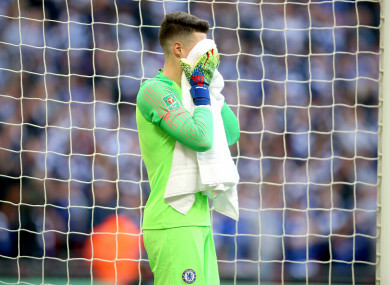 Email “Maurizio Sarri has dropped Kepa for tonight's clash against Spurs after Wembley controversy”. Feedback on “Maurizio Sarri has dropped Kepa for tonight's clash against Spurs after Wembley controversy”.